FOXBORO, Mass. 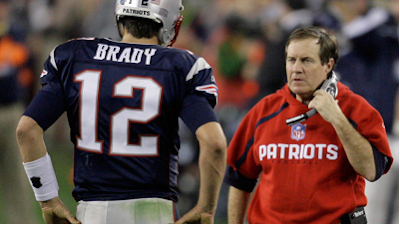 — Patriots quarterback Tom Brady and head coach Bill Belichick have predictably done well for themselves in NESN.com's poll to determine Boston's Biggest Sports Legend. New England right guard Stephen Neal has witnessed their rise to stardom as closely as anybody. When Brady arrived in Foxboro in 2000, he was a fourth-stringer buried behind Drew Bledsoe, John Friesz and Michael Bishop, and Belichick was a head coach with just one playoff trip. Neal is proud to see Brady and Belichick doing so well, considering where they started. "I didn't know anything about football [in 2001]," Neal, a collegiate wrestler, said. "The only guys I could block for were Tom Brady and Michael Bishop. I wasn't allowed on the field when the other two guys were out there, so it's funny how things have changed. But Tom has treated me the same ever since that day. He deserves everything he's gotten. "Coach Belichick deserves everything he's gotten, too. He's one of the hardest working coaches I've ever been around. I'll walk through a wall if he asks me too."